A brilliant choice for a host of kitchens and tasks, the KOHLER K-596-VS blends a classy, universal design with outstanding ergonomics and functionality. While it is not as affordable as the Fapully Commercial Pull Down Kitchen Sink Faucet, it touts a variety of super –thoughtful features to make it worth every buck. If you have a busy kitchen with lots of activities going on, you’re better off investing in a faucet that offers enough space under the sink. That way, you can fill your pots with relative ease and clean your utensils comfortably. On that front, the KOHLER K-596-VS makes a brilliant choice. Not only is the high arch spout 16.6 inches tall, but also swivels at 360 degrees to give you the clearance you need to perform a variety of sink activities. The Simplice is all about supporting a range of operations thanks to the innovative, compact spray head. The stream option is ideal for filling your pots and pans. In the meantime, the sweep spray creates a broad, forceful blade of water to allow you to clean in a breeze. And then there is the pause function to let you stop the running water between tasks at the touch of a button. And, if you use single-hole or three-hole installation with 10 ½ escutcheon plate, you will enjoy a water flow rate of 1.8 gallons per minute at a pressure of 60 psi. The K-596-VS’s has one of a kind styling with smooth, fluid lines. These ensure that the faucet is compatible with a variety of kitchen styles and designs. On your part, it means simple maintenance and cleaning. In other words, you don’t have to spend a lot of time and effort to keep this faucet in its best possible working condition. One of the most common gripes about kitchen faucets is the difficulty of controlling water volume and temperature. Well, that shouldn’t be a cause for concern with the Simplice thanks to its integrated ceramic valves. On top of that, the temperature memory allows you to turn the faucet on/off at a setting of your choosing. And then there is the touch control to enable you to shift from steam to spray in a cinch. For a faucet to work the way it should, you have to install it correctly. In fact, some manufacturers insist that you hire a professional plumber to keep the warranty valid. On the note, the KOHLER K-596-VS uses a revolutionary, brand-exclusive tech with ball joint, nylon hose and flexible joints for quick installation. In fact, if you’re a DIY enthusiast, you can install this thing without any struggles. You don’t have to worry about mineral deposits interfering with the way this faucet’s spray head spews water. The distinctive head uses exclusive technology to prevent accumulation of buildup that blocks the water flow. By extension, this makes it easy to clean the head. A few wipes every day and you can count on the Simplice to give a reliable performance time and again. ProMotion Technology – We love this faucet’s light, thoughtfully braided hose that enables you to move the spray head as per your needs whether you are washing your dishes or filling your pots. DockNetik – The K-596-VS uses a magnetic docking system conveniently placed inside the spout to lock the spray head safely into place when you are not using the faucet. It also helps give your sink a clean, uncluttered look. 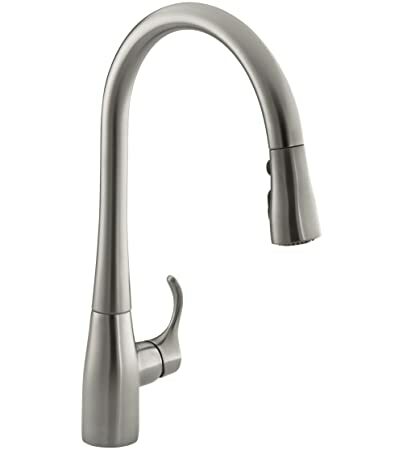 The KOHLER K-596-VS Simplice is a top rated kitchen faucet if you’re in for a broad profile model that installs quickly and works well. It is convenient and flexible. You can even use it for prep or secondary sink. Also, it meets the water saving requirements set the CEC and CALgreen. Plus, the corrosion resistant metal construction offers the assurance that it will always keep water running through it safe for human use. Choose between matte black, stainless steel and polished chrome finishes.